In doing so, the authors produce concrete models that powerfully predict how the marketplace will respond to innovations, providing a much more authoritative way to estimate their potential monetary value, as well as a framework for making it possible to achieve that value. From drones to wearable technology to Hyperloop pods that can potentially travel more than seven hundred miles per hour, we’re fascinated with new products and technologies that seem to come straight out of science fiction. But, innovations are not only fascinating, they’re polarizing, as, all too quickly, skepticism regarding their commercial viability starts to creep in. And while fortunes depend on people’s ability to properly assess their prospects for success, no one can really agree on how to do it, especially for truly radical new products and services. 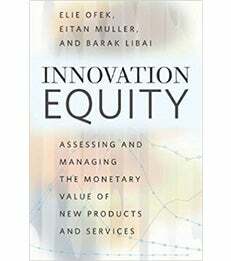 In Innovation Equity, Professor Eitan Muller and co-authors analyze how a vast array of past innovations performed in the marketplace—from their launch to the moment they became everyday products to the phase where consumers moved on to the “next big thing.” They identify key patterns in how consumers adopt innovations and integrate these with marketing scholarship on how companies manage their customer base by attracting new customers, keeping current customers satisfied, and preventing customers from switching to competitors’ products and services. In doing so, the authors produce concrete models that powerfully predict how the marketplace will respond to innovations, providing a much more authoritative way to estimate their potential monetary value, as well as a framework for making it possible to achieve that value.